Children will love their own indoor gym! These versatile pieces encourage gross motor skill development creativity sharing and thinking from a designing point of view! Set includes 11 individual pieces that can build a unique set of soft gymnastic set-ups with different densities of foam and reversable supports. Soft log and beam are 12″ cross section and 4′ long. 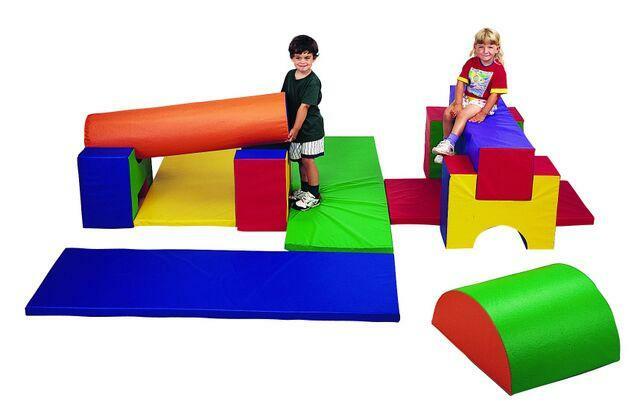 2 mats 2′ x 4′ and 2 mats 2′ x 6′ for tumbling and safety. This is a heavy or oversized item and requires additional shipping. THIS ITEM WILL DROP SHIP FROM THE MANUFACTURER AND TAKE ABOUT 2-3 WEEKS FOR DELIVERY.